Highland Woodworking is pleased to introduce you to Curtis Turner, our newest contributing writer to The Highland Woodturner. Even though he has been a “Turner” his entire life, he knew turning was a skill that required the guidance of a master to develop it fully. He worked closely with an experienced turner, who helped him train his eye (and hand) to blend curves, develop pleasing forms and sharpen tools efficiently. 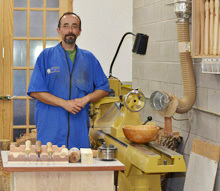 The guidance he received in his early days of turning has convinced him that success in woodworking credits back to both formal instruction and membership in a community of woodworkers. Ready to Jumpstart YOUR Turning Skills? CLICK HERE to read more! About 3 minutes ago from Highland Woodworking's Twitter via Hootsuite Inc.